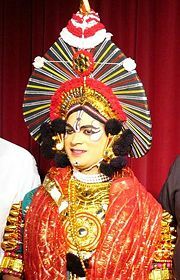 A Yakshagana artist wearing pagaDe or kedage mandala, one type of headdress. Among the headdresses, paga de and kirita are worn by male characters and only small paga de by female ones. Unusual and different headdresses are also used by jesters and some secondary roles. Yakshagana (Kannada:ಯಕ್ಷಗಾನ, pronounced as yaksha-gaana) is a traditional dance drama popular in the coastal districts and adjacent areas of the state of Karnataka, India. It is believed to have evolved from pre-classical music forms and theatrical arts. Yakshagana is popular in the districts of Uttara Kannada, Shimoga, Udupi, Dakshina Kannada and the Kasaragod district of Kerala. 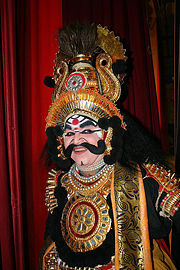 Yakshagana combines dance, music, spoken word, elaborate costumes and makeup, and stage technique with a distinct style and form. It is generally regarded as a form of folk theater, but possesses strong classical connections. Yakshagana arose from the Vaishnava bhakti movement as a means of entertaining and educating the common people, and was well-established by the sixteenth century. Yakshagana troupes played a vital role in propagating the virtues portrayed in Indian mythology. Teams of 15 to 20 performers walked from village to village, carrying their baggage on their heads, staying in the temples and erecting a very simple stage. Performances were commonly staged in the paddy fields at night. There was typically no admission fee for any performance; troupes were supported by temple funds and public offerings. Yakshagana enjoys great popularity in predominantly rural areas of Karnataka, and its exponents are honored as great stage actors. A performance usually depicts a story from the Hindu epics of Ramayana and Mahabharata and the mythology of the puranas. During the nineteenth century a number of new compositions were created and performances began to be held outside of Karnataka. In the twentieth century, Yakshagana was commercialized by traveling “tent groups” who charged admission for performances, the local Tulu language was introduced onstage, and the repertory expanded to include adaptations of Shakespeare and plots from movies. Performance times were shortened to suit city dwellers. Yakshagana is a cherished cultural heritage of the coastal districts of Karnataka, and is now gaining recognition all over India. Yaksha-gana literally means the song (gana) of a Yaksha. Yakshas were an exotic tribe mentioned in the Sanskrit literature of ancient India. The theater form was originally called Bayalata (open place play) or simply Ata (play). The word “Yakshagana,” which referred only to the songs, came into use as a name for the whole art in the context of written commentary, handbills, leaflets, and advertisements. The name “Yakshagana” primarily refers to the traditional theater form prevailing in the Coastal and Malnad areas of Karnataka, but it is also associated with other forms prevailing in other parts of Karnataka, and its neighboring states of Andhra Pradesh, Kerala, Tamilnadu and Maharastra,such as the Mudalpaya of Southern Karnataka, the Doddata of Northern Karnataka, the Kelike in the borders of Andhra Pradesh, and the Ghattadakore of Kollegal in Chamarajnagar. 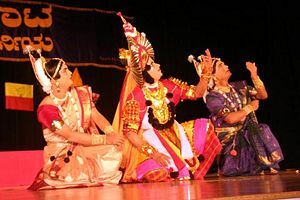 Ghattadakore is a direct offshoot of Coastal Yakshagana, while Mudalapaya is the most closely connected form. A form of dance theater called Yakshaganamu in Andhra Pradesh also shows some resemblance to the forms of Karnataka plateau region. Yakshagana is essentially a product of the Vaishnava bhakti movement which originated in southern India from the fifth to the seventh centuries and emphasized devotion to and love for Vishnu as the chief means of spiritual perfection. The bhakti movement spread with vigor after the tenth century, taking religion to the lower classes of society for whom the highly formalized Vedic religion was out of reach. To propagate and spread the message of devotion among the common people, existing folk music, dance and drama, as well as classical literary styles and performances, were adapted to create new forms of performing arts. 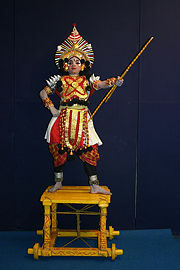 Most of the traditional forms of Indian theater, such as Ankhia Nata (Assam), Jathra (Bengal), Chau (Bihar, Bengal), Prahlada Nata (Orissa), Veedhinatakam and Chindu (Andhra), Terukoothu Bhagawathamela (Tamil Nadu), Kathakkali (Kerala) resulted from this phenomenon and, in spite of major differences, bear a clear resemblance to each other. Yakshagana is a member of this group. Experts have placed the origin of Yakshagana from the eleventh century to the sixteenth century. According to Vidwan Bannanje Govindacharya, a prominent Vedic scholar, the earliest reference to Yakshagana is a legend attributing its origin to a Dasavathara Ata performance and troupe founded by Sage Narahari Thirtha (c. 1300) in Udupi. Yakshagana was an established form by 1600, when the Yakshagana poet Parthisubba wrote the Ramayana in Yakshagana. He is said to have been a Bhagawatha (singer) himself and is believed to have founded a troupe; he was probably the formulator of the Tenkuthittu (Southern style) of the art. 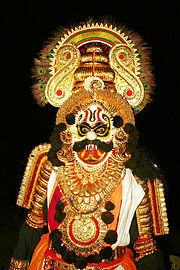 Yakshagana troupe centers like Koodlu and Kumbla in Kasaragod District, and Amritheshwari, Kota, near Kundapur, claim to have had troupes for as long as three or four centuries, indicating the art form had taken shape by about 1500. Yakshagana as it is performed today must have evolved slowly, drawing elements from ritual theater, temple arts, secular arts like Bahurupi, royal courts of the time and artists’ imaginations. During the nineteenth century, socio-economic changes in India brought about changes in performing arts like Yakshagana. A large number of new compositions were produced and the art form began to be performed outside its native territory. Around 1800, a troupe from Dharmastala visited the court of the king of Mysore and established a troupe there. In the 1840s, a troupe from Uttara Kannada (North Kanara) visited Maharastra, and inspired the first modern age mythological drama by Vishudas Bhave. A number of troupes arose all over coastal Karnataka and possibly in other parts of Karnataka. By the early decades of the twentieth century, the structure of Yakshagana reached a definite shape and form. In the 1930s some changes occurred in compositions, organization, and presentation. Dance and the spoken word was further developed and refined, but costumes began to degenerate as 'modern' clothing and stone jewelry replaced hand-woven fabrics and wooden ornaments. In 1950, Yakshagana was commercialized by 'tent' troupes, selling tickets for performances in 'tent theaters' with seats for the audience. Electrical lighting replaced the 'gas lights' or 'petromax' lamps and seating arrangements improved. Themes were expanded to include folk epics, Sanskrit dramas and created (imaginary) stories. Popular entertainment value, rather than 'classical' presentation, became the standard for judging a Yakshagana performance. Tulu, the language of the southern part of the Dakshina Kannada district, was introduced on the stage, where previously only Kannada had been spoken, greatly increasing the popularity of Yakshagana. All these trends continued with added vigor after the 1970s. The writer Dr. Kota Shivaram Karanth experimented with the dance form by introducing Western musical instruments. He also reduced the time of a Yakshagana performance from 12 hours to two and half hours, for the convenience of city dwellers. Modern Yakshagana has undergone considerable innovation, including adaptations of Shakespeare. and the incorporation of movie stories. Yakshagana was performed in Hindi for the first time in 2005. A Yakshagana performance consists of a Himmela (background musicians) and a Mummela (dance and dialog group) which together perform a Yakshaga prasanga. The Himmela consists of a Bhagawata who is also the facilitator (singer), a maddale, a harmonium for drone and chande (loud drums). Yakshagana performances traditionally last all night. A Yakshagana performance begins at twilight with the beating of several fixed compositions on drums called abbara or peetike, for up to an hour before the 'actors' appear on the stage. The performance opens with a puja (devotional ritual) to the temple deity, followed by buffoonery by Kodangis. The actors wear resplendent costumes, head-dresses, and painted faces which they paint themselves. Every actor must have physical stamina in order to sing, dance, act and converse the whole night, as well as a sound knowledge of Hindu scriptures The Bhagavata is the producer, the director and the master of the ceremonies. Traditionally he is a leader of the troupe, responsible for discipline and control among the artists. He provides guidance about the script (prasanga), the background story and the role and responsibility of each character. The Bhagavata is the chief narrator of the story, and also carries on light-hearted banter with the jester (Vidushaka). In every act, there are gods, goddesses, kiratas (mischief mongers), kimpurushas (mythological figures) and demons. The key characters, known as Kattu-veshas appear after the Bhagavata, causing the sleeping or drowsing audience to sit up and take a keen interest in the proceedings onstage. A performance usually depicts a story from the Hindu epics of Ramayana and Mahabharata and the puranas. There are two types of episodes, kalyana and kalaga. Kalyana means "marriage" and ends happily with the wedding of the hero or heroine; some examples are Subhadra Kalyana, Hidimba Vivaha and Rukmini Swayamvara. Kalaga means "heroic fight," and ends with the villain's death and the hero's victory, or occasionally with the tragic end of the hero; examples are Babruvahana Kalaga and Karnarjuna Kalaga. An episode is narrated in a sequence of songs called prasagana. Generally, each episode has about 400 songs. The Baghawatha (narrator) either narrates the story by singing or sings pre-composed dialogs between the characters, backed by musicians playing on traditional musical instruments. The actors dance to the music, with actions that portray the story as it is being narrated. All the components of Yakshagana - music, dance and dialog - are improvised. The complexity of the dance and the amount of dialog depends on the ability and scholarship of the actors. It is not uncommon for actors to get into philosophical debates or arguments while remaining within the context of the character being enacted. Yakshagana is performed in a rectangular stage, built with four wooden poles on the corners and covered on top by mats of palm leaves on the top. Away from the backstage is a small chowki, the green room for the performers. The audience sits on all the three sides of the platform and a curtain covers only the back of the stage. A raised bench or some tables are placed behind the stage for the Bhagavata and his accompanists, the Himmela. The man who plays the chande (drum) sits at the right hand corner. The foot work, body movements, gestures and facial expressions of the actors in a Yakshagana performance visually aid the comprehension of the play. The dancing patterns of Yakshagana are devoid of gentle movements and consist of squatting and jumping that requires quick body movements. The rhythm of the percussion instruments sets the tempo. During the battle sequences, the dance is swift and intense and the pattern varies from one character to another. Performers wearing heavy costumes jump high in the air and twirl vigorously without losing their physical balance and rhythm. Facial make up, made of vegetable dyes, ranges from simple to intricate designs depending upon the character’s role. The motif on the face varies for heroes, demons and female characters. The faces of kings and princes are painted rosy pink, Yama's face is black, Lord Krishna and Vishnu are painted blue. Demonical make-up is heavy, with artificial eyelids and white dots liberally applied to portray the ferocious and violent nature of the demons. The traditional costume consists of a dhoti, a pajama, a jacket or vest, and a loose gown. The vest-like garment is generally in shades of green or red, and the dhoti has red, black and orange checks. Red-and-white cloth is tied around the waist at the back. A character’s girth is sometimes increased by tying sheets of colorful cloth and saris around him. It is customary for males to perform the roles of females. Female costumes are simple, typically the garments worn by local women. Ornaments are made of light wood, canvas and fabric, finely covered with golden foil and inlaid with colored mirrors, stones, and beetle wings. Beautiful appliqué work is done on the armlets, crowns, and belts. Armlets (bhujakeerthi) worn near the elbows look like wings. Besides the heavy armlets and anklets, performers wear intricate edehara (chest ornaments made of wood and decorated with paper and glass pieces) and veeragase (an ornament tied around and flowing beneath the waist. Headdresses (kirita or pagade) are complex constructions, with several tiers made from canvas and fabric stuffed with hay, and a portion made of wood covered with gold foil and inlaid with attractive artificial stones, glass and mirrors. The headgear is commensurate with the role of the actor. The crown, a symbol of sovereignty, is worn by all kings, and demonical characters wear another type of crown with a colored disc in front and ear ornaments. Less important characters wear simple turbans of cloth. The mundasu is a heavily-set headgear, broader in the middle and tapering upward to resemble a lotus leaf. The mundasu is very heavy and talent and physical prowess are required to wear it while performing intricate dance movements. Valiant heroes or warriors like Karna, Arjuna, Gods and God incarnates who fight great battles and perform deeds of honor. Valiant characters such as Indra, and Gaya who are often flamboyant, vain or even silly. Rakshasas and Rakshasis (Demons) who signify strength, and valor but are evil and cruel by nature. Gods and Goddesses like Durga, Chandi, and Narasimha who take up destructive roles in order to crush evil and sin, when everyone else has failed. Intermediate characters such as Hanuman, Vali, and Janbava who have the shape of beasts but are human in nature. Hasyagara (Hanumanayaka) who appears mostly as a servant or messenger and wears mundane, ordinary clothing. Yakshagana music is based on pre-Karnataka Sangeetha ragas characterized by melodic patterns called mattu, and Yakshagana talas. Yakshagana talas are believed to be based on the groves which later evolved into Karnataka Sangeetha talas. Yakshagana ragas and talas were both influenced by folk traditions. Yakshagana has a complete and complex system for rhythms, called talas. It is believed that Yakshagana talas use pre-classical rhythm patterns guided by the meters of Yakshagana poetry. The tala determines how a composition is enacted by dancers. Its role is similar to tala in other forms of Indian music, but it is structurally different from them. Each composition is set to one or more talas, and is rendered by the Himmela (percussion artist(s)) to support the dance performance. The rhythm instruments in Yakshagana are the chande, maddale and a Yakshagana tala (bell). The most common talas in Yakshagana are matte, eaka, udaape, jampe, rupaka, trivde, atta, korE and aadi. Each tala has a cycle of N beats divided into M bars. Some talas, such as the abbara tala, are more than five minutes long. Though the names of Yakshagana talas are similar to names of Karnataka Sangeetha, only a few of these resemble each other and many are completely different. The Yakshagana talas predate Karnataka Sangeetha talas, and it is generally agreed that the rhythm patterns that form a basis for Karnataka Sangeetha also form a basis for Yakshagana talas. A folk flavor added to these talas make them very popular among the followers. Yakshagana music vocalists (Bhagavathas) mark the tala by tapping bells. Talas are largely decided by the meter of the Yakshagana poetry . Yakshagana ragas are the melodic modes used in yakshagana, based on pre-classical melodic forms comprised of a series of five or more musical notes upon which a melody is founded. Different rāgas are associated with different times of the night throughout which Yakshagana is performed. Ragas in Yakshagana are closely associated with a set of melodic forms called mattu which specify the rules for movements up (aaroha [आरोह]) and down (avroha [अवरोह]) the scale, which swara (notes) should be more prominent and which notes should be used more sparingly, which notes may be sung with gamaka (a flowing transition from one note to another), phrases to be used, phrases to be avoided, and so on. The result is a framework that can be used to compose or improvise melodies, allowing for endless variation within the set of notes. Unlike other classical forms of musical drama, a Yakshagana performance begins with Raga Bhairavi, an ancient raga said to have been prevalent about 1500 years ago. There are numerous compositions in this raga. Yakshagana ragas follow the meters of Yakshagana poetry, called Yakshagana chandhas. Yakshagana poems (Yakshagana padya) are composed in well-known Kannada meters using the framework of Yakshagana raga and Yakshagana tala. Yakshagana also has what is called a Yakshagana meter. The collection of Yakshagana poems forming a particular musical drama is called a prasanga. The oldest surviving prasanga books are believed to have been composed in fifteenth century; many compositions have been lost. There is evidence that oral compositions were in use before fifteenth century. More than 100 Yakshagana prasanga books are extant, and attempts are being made to preserve the texts by digitizing them. Yakshagana poetry of the past century has been influenced by Hindustani drama and music, and some Hindustani ragas, such as bhimpalas, have been modified to suite Yakshagana performance..
Two competing variants of Yakshagana exist, Badagutittu and Tenkutittu, differentiated by the instruments played, and the costumes worn. The Badagutittu style, as its name indicates, is prevalent in Northern parts of South Canara, from Padubidri to Byndoor and North Kanara District. It makes use of a typical Karnataka chande drum. The Badagutittu style was popularized by Shivram Karanth's Yakshagana Mandira at Saligrama village in Dakshina Kannada as a shorter, more modern form of Yakshagana. Keremane Shivarama Heggade, the founder of the Yakshagana troupe, Idagunji Mahaganapathi Yakshagana Mandali, is an exponent of this style of Yakshagana. He was the first Yakshagana artist to receive the Rashtrapati Award. The second variation, the Tenkutittu style, is prevalent in Southern areas of South Canara, that is, from Mulki to Kasargod. It is accompanied by a Kerala maddalam, a double-sided, leather-headed drum made out of the wood of the jackfruit tree that is a vital element in traditional Kerala percussion ensembles. Its less exuberant costumes, particularly the demon costumes, make it seem more like Kathakali than like Badagutittu. A notable practitioner of Tenkutittu style Yakshagana was Sheni Gopalakrishna Bhat. There are about 30 full fledged professional troupes, and about 200 amateur troupes in Yakshagana. There are about one thousand professional artists and many more amateurs. Professional troupes go on tour from November to May, giving approximately 180-200 shows. Off-season shows include those staged during the wet season, anniversary shows, school and college students’ Yakshagana performances, and some Talamaddale performances. There are approximately 12,000 commercial Yakshagana performances per year in Karnataka. Talamaddale is a form of Yakshagana in which a performer in plain clothes, sitting in front of Bhagavatha and musicians, enacts various aspects of his character from the chosen prasanga (topic), solely through his speech. Neither the movement of hands nor any action is allowed; while the Bhagavatha sings songs from the prasanga, the performer conveys everything, the story, dialogues, and development of the plot and characters, with his spoken words. In the process of narration, the performer improvises on the selected topic by adding his own views, drawn from his life experiences. A Talamaddale program lasts an entire night, and is also called Talamaddale jaagara (staying awake throughout the night). Talamaddale is rooted in the tradition of keeping awake in the worship of God during nights of religious importance like Ekadashi. Talamaddale performances are considered vital to the preservation of the Kannada language, which has become adulterated in everyday usage. 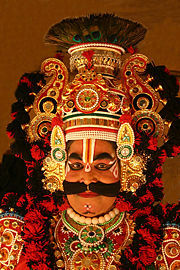 Yakshagana is also used in puppetry. Evidence shows that there were more than 30 string puppet troupes in the undivided Dakshina Kannada district during the period between 1910 – 1915 in places like Basrur, Barkur, Kokkarne, and Mudabidri. Yakshagana puppetry is highly stylized and adheres strictly to the norms and standards of Yakshagana. The puppets used are generally 18 inches high and the costumes are similar to those worn by the characters from Yakshagana, with the same elaborate make-up, colorful head gear and heavy jewellery. The person who infuses life into the puppet and makes it come alive, by dexterous manipulation is known as the Suthradhara. The content in the Yakshagana puppetry is drawn heavily from the ancient epics. 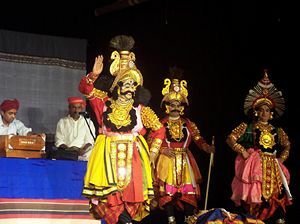 Modern Yakshagana puppetry was shaped by Laxman, Narasimha and Manjappa Kamath, from Uppinakudru village in Kundapur taluk. Devanna Padmanabha Kamath, the grandson of Laxman Kamath, infused new life into it and performed shows all over India. Currently, his son Kogga Kamath is at the forefront, performing shows and training youngsters in Yakshagana puppetry. There are few training schools for Yakshagana in Coastal Karnataka. Most troupes are associated with temples, and the training has been confined to temple premises. The Govinda Pai Research Institute at MGM College, Udupi, runs a Yakshagana Kalakendra in Udupi that trains youngsters in this ancient dance form, and does research on language, rituals and dance art forms. Gundabala Hanuman Temple, in the village of Gundabala, 13 kilometers east of Honavar, Karnataka state, is famous for performances of Yakashagana harakeyata. The presiding deity of the village, Hanuman, is believed be very fond of "Yakshagana" performances, and nightly performances of harakeyata are held continuously for 150 days every year, commencing after the Dasara festival in October and continuing until the monsoon rains begin in the first week of June. The practice has continued for centuries. The temple premise has a permanent chowki (green room) and rangasthala (stage). The temple’s own troupe performs every day, and outside troupes are sometimes invited so that two simultaneous performances can be staged. Devotees take a vow to entertain the deity by sponsoring his favorite dance for a night, upon receipt of a favor such as a cure for infertility, request for marriage, or the recovery of a child from a life-threatening illness. The faithful are so enthusiastic that sponsorships must be reserved five years in advance. No admission is charged and performances continue whether or not an audience is present. ↑ Encyclopedia Britannica, Yaksha Retrieved November 29, 2008. ↑ 2.0 2.1 Sunil Gonsalves, Yakshagana-The music of celestial beings. OurKarnataka.com. Retrieved December 10, 2008. ↑ 3.0 3.1 Sanjay Kumar, Growing with tradition The Hindu, (October 14, 2005) Retrieved December 10, 2008. ↑ 3-day festival to celebrate Karanth's birth centenary The Times of India (December 20, 2002). Retrieved December 10, 2008. ↑ The Hindu-A broad sweep at the art form. Hinduonnet.com. Retrieved November 29, 2008. ↑ 6.0 6.1 6.2 Leela Venkatraman, The Hindu- Focus on rural art The Hindu (December 23, 2005). Retrieved November 29, 2008. ↑ Robert Hapgood, "Macbeth distilled: A Yakshagana production in Delhi," Shakespeare Quarterly 31 (3) (Autumn, 1980): 439-440. ↑ 8.0 8.1 8.2 Karavali Utsav, Yakshagana.karavaliutsav.com. Retrieved December 10, 2008. ↑ 9.0 9.1 WebIndia.com Yakshagana Retrieved December 10, 2008. ↑ Ganesh Prabhu, Enduring Art The Hindu (June 10, 2004). Retrieved December 10, 2008. ↑ 11.0 11.1 WebIndia123.com Yakshagana Retrieved December 10, 2008. ↑ Yakshagana BangaloreBest.com. Retrieved October 23, 2012. ↑ Sridhara Uppara. Yakshagana and Nataka Diganta publications, 1998. ↑ Bhagavatha Narayanappa Uppura, Yakshagana Shikshaka. (Mangalore, 1985). ↑ Sediyapu Krishna Bhatta, Kannada Chandassu, Mangalore. ↑ Sridhara Uppura, Diganta Sahitya publications. (Managalore: 1998). ↑ 19.0 19.1 19.2 Snippets Narthaki.com. Retrieved November 29, 2008. ↑ Open study-chairs for research on Yakshagana The Hindu (July 9, 2007). Retrieved November 29, 2008. ↑ Ratula Halder, Traditional touch in theatre The Telegraph (November 21, 2006). Retrieved November 29, 2008. ↑ G. S. Bhat, Deriving inspiration from life Deccan Herald (December 19, 2003). Retrieved November 29, 2008. ↑ Award for achievement The Hindu (March 7, 2006). Retrieved November 29, 2008. ↑ Yakshagana Kendra has effectively popularised the art form The Hindu (October 5, 2006). Retrieved November 29, 2008. ↑ The Village of Gundabala K.L.Kamat. August 6, 2001 Retrieved November 29, 2008. Bapat, Gururao V. Yakṣagaana: performance and meaning, a semiotic study. Udupi: Regional Resources Centre for Folk Performing Arts. 1998. Haridāsa Bhaṭṭa, Ku. Śi. Samagra yakṣagāna: parampare mattu prayōga. Maisūru: Rāṣṭrakavi Gōvinda Pai Smāraka Kēndra, Vḍupi paravāgi Gītā Buk Haus. 1978. All links retrieved July 31, 2013. This page was last modified on 31 July 2013, at 23:15.